Spacecraft. Satellites. Aircraft. Rockets. Drones. If these machines and the technological processes behind them appeal to you, then consider majoring in aerospace science and engineering. Simply stated, aerospace engineering is a specialized field of mechanical engineering that will teach you how to design and build machines that fly. As an aerospace science and engineering major, you will learn core mechanical engineering concepts and applications, and practice computational analysis. You’ll also learn the fundamentals of design, propulsion and aerodynamics. 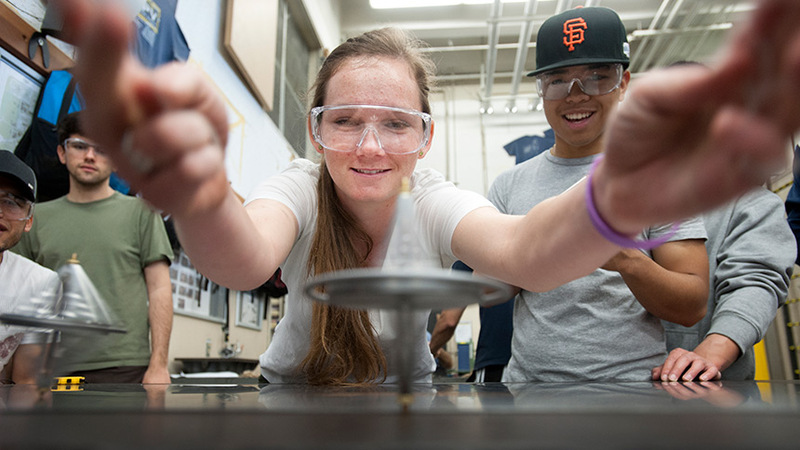 While the major coursework itself is heavy on math, physics and theory, aerospace science and engineering, students also get a ton of hands-on experience. You’ll have the opportunity to design, build and test unmanned aerial vehicles, aircraft, rockets and satellites by participating in one of our student clubs and organizations, like the Advanced Modeling Aeronautics Team, and by assisting faculty and graduate students with their research. As part of your senior engineering design project, you’ll design an aircraft and compete against both national and international student teams. Last spring, two of our senior design teams tied for second place in NASA’s Supersonic Aircraft Design Competition, which challenged students to design a modern, environmentally friendly and competitively priced supersonic business jet. Teams Emperor and Supersonic Sprocket impressed NASA so much that they placed higher than both UC Berkeley and Georgia Tech — universities with great engineering reputations. Pretty impressive, no? Maybe you’re thinking, “This all sounds great, but what will I do after graduation?” Well, just ask our department chair and UC Davis alumnus, Professor Stephen Robinson. A retired NASA astronaut, he’s been on four shuttle missions, completed three spacewalks and logged 44 days in space. His fourth trip to space in February 2010 was on the shuttle Endeavor and involved a visit to the International Space Station. Not many aerospace engineering programs can count a former NASA astronaut among their faculty ranks, let alone someone who is as knowledgeable and down-to-earth as Professor Robinson. If being an astronaut isn’t your career ambition, there are a host of other careers that you can pursue. Aerospace engineers work in industries that research, design and test commercial and military aircraft, missiles, systems for national defense and spacecraft vehicles like the Mars Exploration Rovers. Companies like SpaceX, Boeing, Aerojet Rocketdyne and Virgin Orbit hire aerospace engineers for manufacturing, analysis and design, and research and development of new technologies for air and space exploration. The automotive industry also hires aerospace engineers for their keen understanding of aerodynamics, structures, materials and the need for fuel efficiency. Here’s a snapshot of what some of our alumni are doing. After her team placed second in NASA’s Supersonic Aircraft Design Competition, Maureen went to work for Aerojet Rocketdyne as a structures and dynamics associate engineer, or stress analyst. John works as a propulsion engineer at Blue Origin, an aerospace manufacturer and spaceflight services company set up by Amazon founder Jeff Bezos. John says he supports the company’s vision of having millions of people living and working in space by performing computational fluid dynamics and performance analysis on liquid rocket engine components and systems. Scott is a senior manager in airplane safety engineering at Boeing. Sarah is an aerospace flight systems engineer at the NASA Ames Research Center. She has worked on the International Space Station’s water-recovery system and the hypersonic reentry for the Orion Crew Modulespacecraft. Overall, aerospace engineers play a vital role in the advancement of aircraft and spacecraft. With a firm foundation in mechanical engineering, they also provide expertise and innovation to other industries. And they can be astronauts. It's no wonder that aerospace science and engineering majors are pretty out-of-this-world. Author Pamela Kisting is an undergraduate program coordinator in the Department of Mechanical and Aerospace Engineering at UC Davis. Co-author Bonnie Dickson, is a communications specialist in the College of Engineering Dean’s Office.